Faced with rising costs for materials and energy, stampers also are challenged to produce higher-quality parts with tighter tolerances. U.S. manufacturers that for years have touted their dedication to lean manufacturing now must focus on reducing production costs to offset soaring prices for raw materials. They must place greater emphasis on thinking creatively, investing in more efficient metalforming equipment and performing facility energy audits.The right technology solutions can help stampers offset challenges and build a stronger foundation for surviving in a struggling economy. Knowing where to start—or where not to start—is the first step. Companies running old equipment or presses that have not been well maintained will likely find it difficult to compete. Attempting to perform stamping jobs with presses that have resided on the shop floor for many years, but may not offer the most cost-effective manufacturing solutions, can prove unproductive. Customer requirements must be evaluated with equipment choices that can deliver the least-costly production methods while meeting the necessary performance demands. Capital-equipment purchases no longer are just about the press. Metalformers must address the entire stamping system. For some companies, a starting point might be purchasing better material through vendors with stricter quality standards. Better raw material means better part consistency. • Can a tool station be eliminated if the press has a modified slide motion? • Can a better part be produced with the addition of one or more tool stations? • Will a quick-die-change (QDC) system be beneficial? Stampers should specify press lines flexible enough to efficiently handle changing order quantities, illustrated here by this progressive-die straightside press automated for transfer and feed-line capabilities. Photo courtesy Luitink Mfg. Co.
• What is the best to handle offal? • How should finished parts be packaged? • What is the best method for storing and shipping finished parts? Output and efficiency can suffer due to a lack of the right equipment. 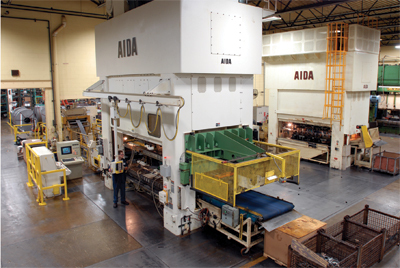 If a stamper needs to run tighter-tolerance parts, it must operate tighter-tolerance presses. The press accurately (or inaccurately) provides the force to the die. Part accuracy cannot be achieved by only optimizing die design and build. Technology developments during the last decade have greatly improved press tolerances. For example, the accuracy of some mechanical-press guiding systems can so closely control punch motion and the relationship between the punch and die that some mechanical presses now are more accurate than the die set. The introduction of lube-free preloaded roller bearings into the slide-guide system of some presses eliminates the potential for press-oil contamination of a part. And, development of a dry slide guide—different from standard high-speed slide-guide technology —employs a proprietary roller-bearing mount with the ability to swivel. This helps the roller maintain contact with the guide surface on the column during off-center-load situations. Lube-free, preloaded, roller-bearing slide guides allow metalformers to use a straightside press to produce a variety of stampings from high-volume, thick progressive-die parts to larger, lower-volume cosmetic pieces. The latest development in precision slide guiding is the preloaded zero-clearance slide-guide system with high-pressure oil lubrication, which creates a press more accurate than a die set. This system avoids slide tipping caused by high off-center loads; slide shimmy caused by shock at the point of contact between the punch and material; and snapthrough at the time of material fracture. The guides comprise spherical shoes operating against flat guides attached to a massive frame structure. The very tall press slide enables the guide points to be spaced far apart and provide extremely long slide guides. The surfaces of the mating components are of materials that possess natural lubricity. Oil then is forced between these preloaded surfaces. This combination of preload and oil lubrication not only makes the slide guide very stiff, but also provides long life with little or no wear. Machine flexibility—a press that can produce a wide range of parts—and capabilities such as QDC and fast part-to-part changeover—can improve uptime. Stampers should aim for a machine-uptime rate of 70 percent or more—this means actual cycling of the press to produce parts and does not include QDC, part changeover or other ancillary processes. And today, QDC systems allow metalformers to change dies in a matter of minutes. Transfer lines—this one comprised of servo-driven gap presses—help stampers minimize costs and run lean. Photo courtesy Newman Technologies S.C.
production system. Having the next die ready and in position, coil feeding or part destacking, scrap removal and finished-part removal and conveyance all affect part-to-part changeover. For progressive-die press operations, coil-handling systems offer numerous opportunities to improve uptime. The use of coil cars and double dereelers is a good place to start. Follow this by adding a threading table and a programmable control that allows for the storage of setup parameters for the entire feed line, and a stamper is well on its to improving machine uptime. Once a new strip has entered the die, having a strip start mark on the die block can save time and avoid die damage. Also, during die design, the designer should account for automatic threading in continuous mode, a feature that can save many minutes of downtime. In transfer-die and press-to-press transfer systems, using the proper blank-feeding device can increase productivity by sensing and correcting double-blank misfeeds and reloading the blank feeder without requiring the operator to stop the press. The blank feeder should automatically discharge extra blanks upon double-blank detection. Blank-hold devices allow a few blanks to be automatically held while the next blank stack moves into position. This also eliminates the need for the operator to stop the press when the blank supply runs low. Stampers also can set up a data-bank program in the system controller that houses all of the machine settings for each part to be run, which will raise productivity by allowing quicker part-to-part changes. A servo-transfer or coil-feed mechanism allows a press to change motion profiles for the transfer pitch, the bar-clamp motion and lift motion. Or, with a coil feed, the progression as well as the acceleration and deceleration of the material in the feed cycle can be changed. An electronic servo-transfer or coil-feed mechanism can deliver increased production speeds and greater efficiency because all feed profiles can be adjusted and retimed for each part or job to achieve optimal operating speed. In addition, once job programs have been written, they can be stored, eliminating the need to constantly reprogram the press. Stampers also can leverage press technology to minimize offal, by producing parts close to specification. Servo-drive presses give the stamper fully programmable slide motion and adjustable stroke length, which can reduce reject rates by allowing stampers to form parts from material that would normally carry a high reject rate. In addition to controlling the amount of scrap generated, the nearly limitless number of s stroke, velocity and dwell profiles can be programmed and combined provides the flexibility to quote jobs stampers may not have considered in the past.